The complexity of RVs can be frustrating, but the multiple electrical systems in RVs are essential in order to accomplish the various tasks required. Generally, RVs contain both a 120 VAC (120 volt alternating current) system and a 12 VDC (12 volt direct current) system. It’s important to know how to avoid an electrical accident. Most accidents and injuries arise from contact with electrical current and are a result of lack of understanding or negligence on the part of the person injured. Here we’ll outline the different types of electrical systems in your RV and the safety precautions to take when working with them. Alternating current (AC) is the more familiar electrical system. It is the same type of power used in houses. For RVs, there are typically three different sources that provide AC power: shore power (the electrical pedestal at your campsite), generator, and inverter. The 120 VAC system operates most of your household devices including air conditioners, fans, water heaters, TVs, coffee makers, and virtually any of the “extras” you would want in your RV. Always make certain to shut off electrical power. It is best to turn off the main breaker in the AC distribution panel and to disconnect shore power at the sources. Post a sign on or near the short cord connection and distribution panel to warn others that you are working on the electrical system. This step is intended to prevent someone else from plugging in the power cord or turning the system on. Take a moment before working on or touching a 120 VAC power source to use a test probe or meter to verify that the circuit you are working on is not energized. If your RV is equipped with a generator with an automatic start feature, be sure to disable this feature before you begin working. Consult the generator’s operating instructions or turn off the main breakers on the generator to be certain. 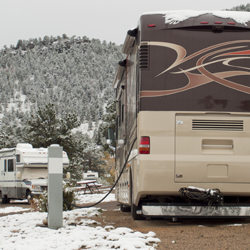 RVs equipped with an inverter may energize some circuits, even with the generator output disabled and shore power disconnected. Be certain to disable the inverter’s AC output by turning off the main breaker in the inverter sub-panel or by disconnecting the DC input to the inverter. Consult your inverter owner’s manual for specific instructions on disabling inverter output. When working on or near circuits that must be energized, use only properly insulated tools and great caution. Routinely inspected tools and test instrument probes to ensure they are not damaged and a potential shock hazard. When working on the RV electrical system from outside the coach, avoid using aluminum ladders and touching other metal objects such as metal pipes or poles that create a low resistance path to ground. Touching a low resistance path to ground could make YOU the path of least resistance. When replacing breakers or fuses, always use breakers rated appropriately for the conductor (wire size) that they are intended to protect. If you are uncertain of the correct breaker size, consult a qualified electrician. Over time and with repeated usage circuit breakers can weaken, resulting in more false tripping. Replacing consistently tripped breakers should be one of your first trouble-shooting procedures. When repairing or replacing any 120 VAC component or wires in your RV, use an identical item to assure that it has adequate capability to handle the electrical current. Do not arbitrarily replace breakers with a higher amperage rating to cure a frequent false tripping problem. This might overload the wire presenting an overheating or fire hazard. It is better to find the actual cause of the repeatedly blown circuit breaker and repair it as required. The second type of electrical power used in RVs is low voltage direct current (DC). DC in RVs consists primarily of 12 volts with some larger coaches and buses employing 24 volts or a combination of 12 and 24 volt systems. The DC used for these systems normally comes from one of five sources on an RV: engine alternator, power converter/inverter, battery bank, solar panel, or wind generator. This system is considered to be the primary power system in the RV and is commonly used to provide power for the water pump, RV engine, instruments, radio, and accessories. Always disconnect DC power when working on the low voltage DC electrical system. When in doubt, it is safest to disconnect the entire system by pulling the negative (ground) battery cable and disconnecting shore power. 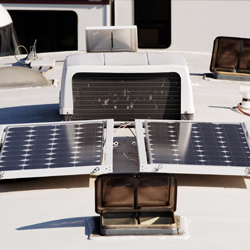 Always disable the converter and solar panels (if present) in your RV before working on the batteries or DC electrical circuits. Even with the batteries disconnected, the solar panels or converter may be capable of producing DC power and energizing the circuit you are working on. Consult your owner’s manuals for specific instructions on disabling or disconnecting these devices. Some RVs have a master shut-off switch to shut down DC power. If your RV is not equipped with a DC disconnect switch, you must disconnect the DC ground (negative) conductor from the circuit in order to disable DC power. Do not break a live circuit at the battery terminals due to the risk of arcing in the presence of hydrogen gas. Instead, disconnect the DC ground conductor at the chassis ground connection, which should be far enough away from the battery to minimize the possibility of an arc causing a safety hazard. Note that some master switch systems are only partial shut-off. Be certain that you understand what circuits are shut off with the master switch. These same precautions should also be followed when using a battery charger or when attempting to use battery “jumper cables”. Take a moment before working on or touching a 12 VDC power source to use a test probe or meter to verify that the circuit you are working on is not energized. When working on or near circuits that must be energized, use only properly insulated tools and great caution. Routinely inspect tools and test instrument probes to ensure they are not damaged. Always replace fuses or circuit breakers with identical components that carry the same rating. To use a higher-rated component might momentarily solve a problem, but it might also allow more current to flow in the circuit than the wiring is capable of handling without overheating, damaging the insulation, and possibly leading to a fire. Over time and with repeated usage, circuit breakers can weaken resulting in more false tripping. Replacing consistently tripped breakers should be one of your first trouble-shooting procedures. Familiarity with your RV’s electrical system will yield great dividends in terms of peace of mind and will provide many benefits while you operate and live in your RV. Happy RVing! Source: Electrical Safety Cited with permission from author. Neil W. LeKander – The RVer’s Ultimate Survival Guide. 2002.